This review is cross-posted to Playtest. King of Tokyo is available via Amazon and Funagain Games. LJ: do you take game review requests? please review “king of toyko”! LJ: it’s SUCH a good game! When compiling my annual Good Gift Games Guide, I try to ensure that there is something for everyone: family games, two-player games, abstract games, word games, and so forth. The selections are not ranked by preference. That said, the first two or three slots in the guide are invariable occupied by the GGGs that I most highly recommend. Last year, top billing went to Survive: Escape for Atlantis!. But I have to admit, the runner-up, King of Tokyo, has usurped Survive’s title of Best GGG from 2011. King of Tokyo casts the players as oversized beasts, vying for supremacy in the midst of a teeming (and screaming) metropolis. Each abomination starts with 0 victory points and 20 units of health; if the former hits 20, the player instantly wins; if the latter drops to 0, it’s sayonara Cyberbunny. Thus, a player can win in one of two ways: by amassing victory points, or by knocking everyone else out. 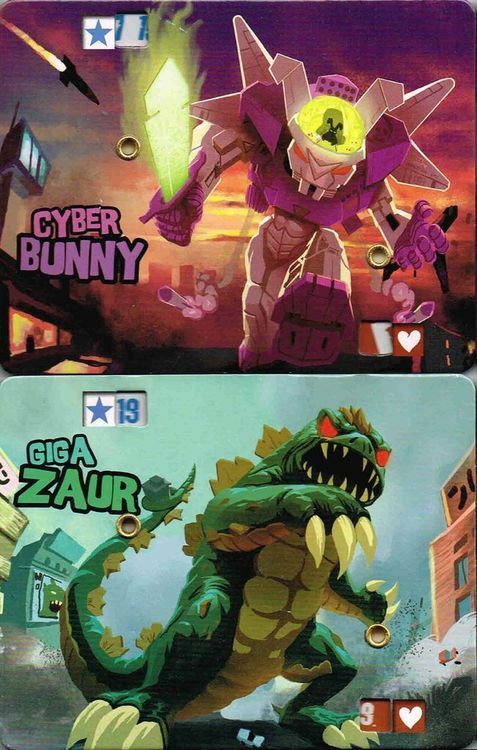 Cyberbunny and Gigazaur. Photo by Raiko Puust. Gameplay is Yahtzee at its core: roll a handful of dice, set some aside, and keep going until you choose to stop or have rerolled twice. One side of every die has a “1”, another side has a “2”, and a third has a “3”; if you roll any of these numbers in triplicate, you score that number in victory points (rolling three 2s gives you two points, for instance). The remaining three sides of each die show icons rather than numbers. Each rolled electrical bolt awards you an energy cube. Each heart restores one unit of your health. And each claw damages some opponents. Deciding when to go for straight victory points, and when to pursue other strategies, is the heart of your turn. If the rolling player is in Tokyo, he damages all other players. If the rolling player is not in Tokyo, he damages the player who is. Entering Tokyo, and holding your position there, awards victory points, so there’s an incentive to paint the town red (with blood). But in doing so, you become a target for your opponents. Thus, you never single out another player for attack: you either attack everyone else (as the King), or you attack the King (who has no one to blame but himself, having put himself in the position of antagonist). Lots of mayhem, no hard feelings. The dice. Photo by Mike Hulsebus. King of Tokyo was designed by Richard Garfield, the creator of Magic: the Gathering. And if you are familiar with M:tG, you know what’s coming next: special powers, and lots of them. In King, these powers take the form of Mutations, which players can buy with the energy cubes they have amassed. 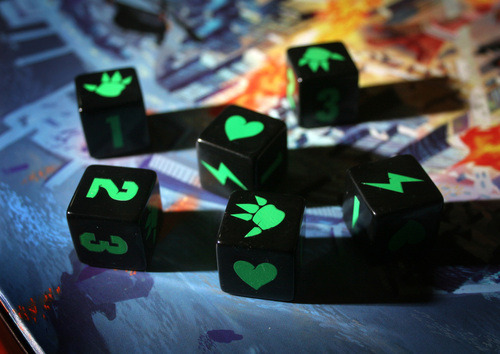 The effect of mutations include extra dice, new ways to gain victory points, additional options for healing, and a host of others. Though every monster begins the game the same, mutations give each a distinct flavor by the end. With a playing time of 20-30 minutes, King of Tokyo is a near-perfect filler. And even gamers like me, for whom “dice” is a four-letter word, will grudgingly admit to kind of loving it.